Right, this is not an advert for my hotels. Rather, I am very 'proud' to see 3 out of my 4 small hotel projects featured on a banner advert that Agoda runs on the TV forum. 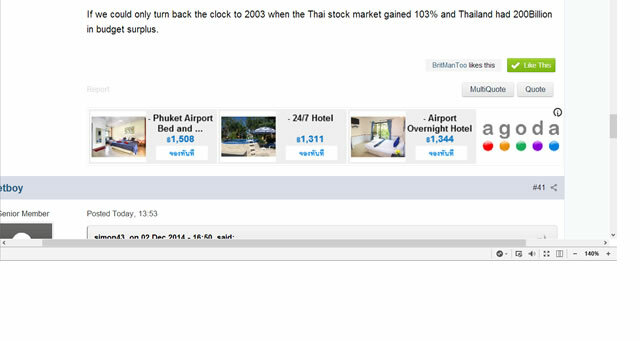 I think this banner is IP address dependant, so it only shows when viewing TV from north Phuket. The only project missing is the 1st hotel - Phuket Airport Hotel, (which I built for me and up-a-palm-tree ex #2. But I see that featured on many other banner adverts. That would explain why Madame Fisters Hotel/Motel appears on my Agoda. Correct, nobody else will see those hotels unless they have previously viewed them. It's a strange form of advertising which either reminds you about a hotel you've already booked or tries to tempt you to book a hotel you've already decided against.